Some passages of scripture contain detailed natural history information about animals. The book of Job, in particular, records many physical and behavioral traits of animals. One such animal described in Job is the ostrich. The ostrich we know today is a strange bird. It is very large, its wings are not able to provide flight function, its bones are heavy and strong like a land mammal, and it displays a number of peculiar behaviors, though contrary to popular belief, it does not put its head in the sand. Previously (Consider the Ostrich: Job 39 and God’s Commentary on His Creation) we explored how these strange birds are portrayed in the Bible and compared them to modern-day ostriches. We concluded from this comparison that the Biblical description of the ostrich matches modern ostrich behavior and physical appearance remarkably well. Today, we want to ask the question: What are the different ways that Christians believe that the modern ostrich came to be? As we sort through some of the models of the origin of present-day biological diversity proposed by Christians it will be helpful to keep in mind some related questions: What did the original—primordial—ostrich that God created look like? Were ostriches once capable of flight? How much have ostriches changed over time? How long ago were ostriches created? Do ostriches share a common ancestor with other similar flightless birds such as emus or cassowaries? Let’s begin by outlining some of the possible Biblical approaches to explaining the origin of ostriches (1). Below is a simple chart of origins model. Following this table is a more detailed description of each of these approaches. Model State of the primordial ostrich When created? How much have ostriches changed over time? YEC-1 Supernaturally created flightless and with adaptations for desert life and peculiar behavioral patterns. ~6000 years ago The original ostrich looked much as it does today including behavior. However, these features were originally designed for a perfect world and then took on new function in the fallen world after Adam’s sin. YEC-2 Supernaturally created flightless but lacking adaptations for desert life or modern maternal behaviors. ~6000 years ago Modern physical and behavioral characteristics are adaptive responses to a corrupted world resulting from God pre-loading future genetic changes into the original ostrich (or ratite) kind. YEC-3 Supernaturally created with the capacity for flight and possibly not an “ostrich” as we would recognize today, but rather an ancestor of many types of flightless birds such as emus and elephant birds. ~6000 years ago Large changes from original condition. Hardly recognizable compared to the modern ostrich as they have “devolved” due to Adam’s sin. Possibly preloaded with genetic programs for future adaptations that may result in many different species. Evolutionary Creation (EC) Evolved from ancient bird ancestors that were flight capable. Continued evolution of subsequent species resulted in the loss of flight and adaptations resulting in the present form. Modern species formed within the past one million years Minor morphological or behavioral changes over the past 100,000 years. * Historical creationism comprises historical views regarding creation that reflect common thinking prior to the 19th century (and anti-evolution stances until the mid 20th century) and include, even, the opinions of many modern-day Christians who have not which still often reflect the common opinion of modern Christians who have not devoted any time to studying origin questions. 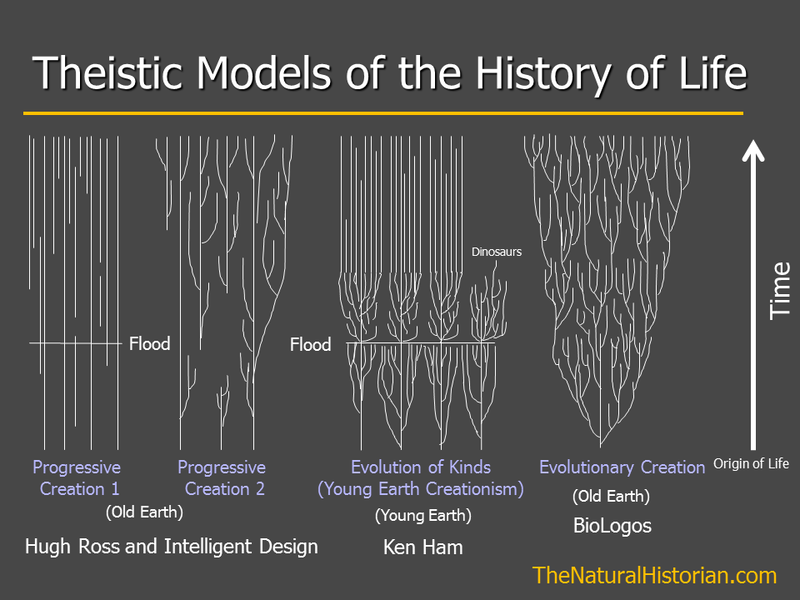 Let’s look at each of the models in the chart above in more detail and ask how each model might interpret passages in Genesis and Job with respect to the origin of birds and ostriches in particular. As we consider these models, a question to keep in the back your mind is: If Adam “named” all the kinds when he named the ostrich what did that ostrich look like? Was it the same or different from what we call an ostrich today? A slide from one of my seminars illustrating some of the primary differences between models for the origins of modern biological diversity from a theistic viewpoint. There are many variations on each of these themes (e.g., the Flood line should probably extend through the Progressive Creation 2 position). I don’t include the historical/traditional creationism view here but it would just but straight lines with no branches from origin to present. Historical Creationism (HC): Prior to the realization that species can change dramatically over time, Christians believed that God made each species very much like we see them today. 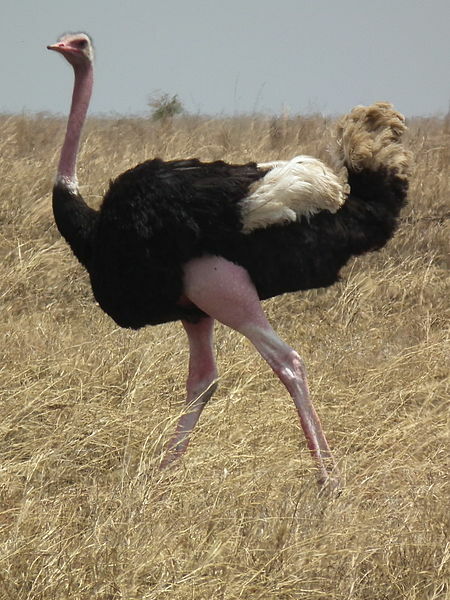 Although no evangelical scholars or scientists subscribe to this model of species fixity today, it is not uncommon for a naive, modern evangelical to observe an ostrich at a zoo and believe that it is identical to an ostrich made on the 5th day of creation and what Adam observed when that bird was brought to him to name. HC interpretation of Genesis and Job: With respect to the scriptures, nothing about the ostrich we observe today conflicts with its description of the ostrich. Adherents to this model would believe that God created ostriches on the 5th day of creation when He “created every winged bird according to its kind” (Genesis 1:11 ESV) about 6000 year ago. Likewise, the author of Job is recounting God’s description of His creation of the ostrich. The ostriches appearance and behavior was identical to the ostriches that Job would have been familiar with. Modern Young-earth creationist (YEC): All YECs agree that God made every type of bird on the 5th day of creation about 6000 years ago. These first birds originally did not experience death, none of them would have been carnivorous, and none of their eggs would ever have been lost due to predators or any neglect on the part of the parent. Beyond this, there is no agreement among YECs regarding the nature (appearance and behavior) of the first ostrich. Flightless or flighted? Adapted for extremely dry and hot environment or adapted to a mild climate? This is why I listed three different YEC models in the chart above. Did God create the ostrich as we know it today or is the ostrich today simply one created “kind” that may include many living and extinct species of birds (I will examine these options in the next part of this series)? If we assume that God created a flighted bird but pre-loaded the adaptations (e.g. pre-adapted them) to lose their ability to fly and to develop intricate designs for survival in hot deserts, this original created kind may have looked very different from an ostrich today. This bird kind may, in fact, have been the common ancestor to not just ostriches but other large ratite birds such as emus, cassowaries and moas. If this is the case, imagining the ostrich in the Garden of Eden the wrong approach. Rather the YEC may believe that the ostrich was not present in the original creation, rather,the hidden potential for an ostrich may have been implicit in another very different bird that lived in the perfect paradise with Adam and Eve. While the primordial condition of the ostrich may be debated, the increasing ease with which YECs appeal to rapid physical adaptation of created kinds to new post-fall and post-Flood environment suggests that many 21st century YECs will be drawn to the perspective that the ostrich of creation could have looked radically different from the one we observe today. YEC interpretation of Genesis and Job: The YEC interpretation of Genesis appears to be at odds with the description of the ostrich found in Job. To resolve this conflict YECs tend to give precedence to the Genesis over the Job account. The YEC is likely to interpret God’s description of the ostrich in Job as the end product of His providential adaptation of ostriches to the post-fall world, rather than describing the primordial ostrich. More specifically, the Job account may be understood by some YECs as God’s description of the present state of the ostrich which God created from an internal, originally unexpressed, genetic “program” built into the original ostrich (or paleognathae) kind. However, the accounts of animals from Job 39 follow God’s asking Job in Chapter 38 if he was there when he “laid the foundations of the world” “or laid its cornerstone” which are clearly references to primordial creation. The God of Job doesn’t hint that His description of the ostrich is not speaking of primordial origins of the ancestor of the ostrich. Despite this, many YECs now feel compelled to believe that God could not have been describing the primordial ostrich in Job (namely due to their need to categorize many species of a modern animals into “kinds” which were preserved on Noah’s Ark). Some creationists who take a more straightforward interpretation of the ostrich description in Job may claim that the descriptions do match the original condition of the ostrich (i.e. they take the Historical Creation approach). They may believe that in the Garden of Eden the ostrich looked just as it does today. We might ask, why then would they manifest the ability to live in hot and dry environments and have wings but yet not be able to fly? The YEC might respond that those traits simply served as other functions before sin entered the world. This is akin to an increasingly outmoded Ken Ham-type argument that asserts God created T-rexes with sharp teeth, but those teeth were originally used to eat leaves and watermelons rather than meat. They might further believe that the curse of Adam changed the behavior of animals but not necessarily their physical features. While this explanation might allow for a similar ostrich in Genesis, most YEC apologists and leaders are now convinced that most, if not all (though not humans), animals have undergone radical changes in their physical features and behavioral nature as a result of the curse on creation. Progressive Creationists (PC or OEC – Old Earth Creationism): The ostrich species was specially created a million, or more, years ago. God may have used the body plan and genome of similar species alive at the time that were flighted birds, but adapted those plans to that of the flightless ostrich. The ostrich has always lived in a world in which death reigned and so was providentially endowed with various features allowing it to survive in that environment. OEC interpretation of Genesis and Job: The Genesis account informs the reader that He created birds during the creation week, which OECs understand to represent long periods (millions of years) of time. During those long periods, birds, in general, were created after plants but before mammals and man. The description of the ostrich in Job informs us of some specific features that God provided the ostrich at the time of its creation. In this sense, the OEC could view the words in Job as reporting God’s description of his primordial creative act resulting in the ostriches familiar to Job and us today. For the OEC there is no need to infer, as most YECs must do, that God is only speaking about the ostrich of Job’s day but knows that the primordial ostrich was very different than the one that Job knew. Evolutionary Creation (EC) or Theistic Evolution (TE): The present-day ostrich species is related by common ancestor to birds that existed many millions of years ago and had the capacity for flight. One of the ancestral species that gave rise to ostriches lost the ability to fly and passed that trait to the modern ostrich species. The fossil record (more on this in a future post) suggest that occurred many millions of years ago. For at least the past 10,000 years, all living ostriches have maintained similar general features and behaviors to those they display today. EC interpretation of Genesis and Job: There is likely to be some diversity in the EC interpretation especially regarding Job. Much of it may stem from the diversity of views held by EC advocates with respect to the sovereignty of God and the nature of His action in upholding His creation. For most ECs the Genesis account informs us that God is the creator of birds though doesn’t speak directly to the means by which he created them. ECs propose that the means by which God created birds and the ostrich in particular may may be the same or similar to those described by secular and Christian scientists studying evolutionary processes. For ECs the Job account also affirms that God is the creator of ostriches and that each characteristic of the ostrich is the intentional product of God’s plan and is “very good.” Most ECs would probably contend that the author of Job was a poet (see footnote 2 about authorship of Job) who was an astute observer of nature. God’s words through that author are not speaking of the primordial creation of the ostrich but rather the creation of the ostrich as it was known in that day in the sense of “I knit you in your mother’s womb” continuous upholding of creation. Similarly, or possibly concomitantly, God could be understood to be accommodating his description to make a theological point and not truly commenting about His creation with respect to the primordial ancestry of the ostrich species. Rather the author of Job is reflecting upon what was commonly known about ostriches in his day to teach Job about the character of God. In the EC view, one would expect that ostriches as a species would be nearly the same during the time of Job as they are today and thus the author and his audience would wonder about and desire an explanation for the ostriches behaviors. God provides that explanation whether through dictated words or inspiration of the poet to demonstrate His wisdom. Just what did the author of Job intend to communicate to us about His creation? That depends on who wrote the book and how (see footnote). Depending on your particular view of biblical inspiration the description of the ostrich could be either 1) God’s direct spoken communication about the primordial created characteristics of the ostrich, 2) God’s description of an “evolved” ostrich but accommodating to Job and his contemporaries experience with ostriches rather than describing the ostrich’s beginnings, or 3) be the poets inspired imagination of the lesson God would draw from what the poet author knew about ostriches but likely did not understood about the true origins of the ostrich. While there are further nuances and complexities related to each model that I’ve not delved into here, I hope that this comparison of views might provide a way for the reader to begin evaluating these positions. I will end by highlighting an interesting, and probably unintuitive, contrast between the YEC and EC models of origins. Most YEC models converge on an understanding of biological diversity stemming from the belief that massive physical changes have occurred to all kinds (except, apparently, the human “kind”) such that common ancestors of today’s species looked very different in the very recent past (a few thousand years). In contrast to this view, while they also believe that today’s species are descendants of very different looking common ancestors, EC believe that those different looking ancestors lived much further in the past. In fact, they lived so far in the past that most have not experienced any significant physical changes within the past 6000 years. As a result, the EC comes to the scriptures expecting descriptions of animals and plants to match species that are familiar to us today, while the YEC should expect that descriptions of species from 3000 years ago should have little semblance to species alive today. With respect to Job we find that the author describes the ostrich just as the EC would expect while the YEC should be puzzled by the fact that none of the animals described in Job seem to have undergone any significant changes from the time of authorship to the present. I shouldn’t leave this post without noting that it is the OEC not the YEC or EC that can claim to best meet the plain-sense reading of the account of the ostrich in Job that preserves a strict view of inspiration that the author of Job is a reporter who is just writing down the exact words that God spoke to Job (again, see footnote on authorship). OECs can contend that they provide a reading of Job that the Ostrich that God made is the very same ostrich that Job records and that we see today. Coming up in next we will take a closer look at what YECs have said about ostriches and flightless birds and specifically critique the YEC-3 origins model from the chart above. (1) Are the descriptions of the ostrich and other animals meant to be lessons about their origins? Although I am using the ostrich explore difference in theistic models of origins I don’t believe the author’s intent was to teach us about origins in this text. I will discuss this further in a future post but briefly, God is telling Job about his wisdom and making a point about his justice not about how he created the ostrich, horse or behemoth. Job is being taught that he should not question God’s justice, rather, like the animals who depend wholly on God for existence, he was to trust God. (2) Authorship and genre of Job – In the post above I have assumed a common view of inspiration held by young earth creationists which take Job to have been written by a human author who recounts a series of historical events. These events and dialogue include those that a human author could not have witnessed but it is assumed that God provided the information for the actions that occurred “behind-the-scenes” either through a vision or some form of dictation. Within this construct of inspiration, the words of God in Job 39 are the recorded words of God spoken directly to us about the ostrich. A different view of Job’s authorship, that could still be considered an orthodox view of the doctrine of inspiration, says that the author of Job was a poet who, pondering the problem of suffering and God’s sovereignty, uses the life of Job, a historical person, though the words spoken by Job, his friends and God are not necessarily the words spoken verbatim by the participants. Likewise, all of the scenes (e.g. Satan appearing before the angels and God) need not be considered literal accounts but poetic devices. In this case, the words of God are what the inspired author accurately understands what God’s response would be to the state of Job and his friends. Of course, there are more liberal approaches that would take the whole book as the imagination of a non-inspired poet who is trying to understand why God would allow suffering. In this case, there is no historical basis for Job and it merely represents a story with a moral lesson. Regardless of whether the text of Job 39 records for us the actual spoken words of God or the inspired imagination of man regarding what God would say “behind the scenes,” what we learn about the ostrich allows us some insight into what the biblical authors and the audience believed about creation thousands of years ago. Hi, Joel. Nice work – I like the idea of using the discussion of the ostrich’s attributes as a lens for examining different views of scripture. Would you be willing for me to share this approach & the image included with my students (with appropriate citations)? Thanks. Feel free to use whatever you find helpful. Very interesting perspectives on Job’s authorship. I have been under the inspired poet authorship for several reasons. I find it inconceivable that a fallen being, Satan, is allowed in the presence of a Holy God whose Presence is “an all consuming fire” to evil beings. That is my main reason, but as for inspiration there are others like when God spoke to Job He asked “Where were you when I laid the foundations of the World?” and Job had already said “that God hangs the World on nothing.” and at the end of Job God told one of Job’s accusers that “you haven’t spoken that which is right about Me as my servant Job has.” The author obviously knew the planet was round and hanging in space and Job is considered the oldest books of the Bible. How would the author know that if not inspired? Off Topic, but there are people who claim to be Christians who posit the Flat Earth nonsense on YouTube and they use verses like Foundations to support it. I say claim to as it could very well be anti-theists trying to make Christians look idiotic. I myself am OEC and have been for quite a long time now, I subscribe to an expansion of Time type theory that comes from physics and Time wasn’t measured by Humankind’s perspective until Adam and Eve. Also just like Christ’s sacrifice is retroactive into the past I believe the Curse from sin is as well to the Creation. Perhaps this will help. The passage under consideration states that those in attendance were summoned there to give accounts. Nothing says Satan (ha shattan – the accuser) stormed in. He came under orders. If you believe God couldn’t bear for satan to be in His presence, maybe you could explain how the HOLY Spirit can dwell in sinful flesh. Wouldn’t that be equally repulsive? As far as the “foundations” reference, this one continues to hang around for those with an agenda. As you stated, both foundations and sphere are used in the same book. If you believe scripture is inspired, does this force you to believe God doesn’t know a “contradiction” when He “inspires” one? Is perhaps metaphorical language involved? Are we being, gasp, too literal? And please, try not to taint the whole of christianity by referencing flat earthers. I’ve have never met or known a flat earther. Seems like everyone else meets them on every corner, at every church they’ve attended, every bible believer. Where do you people find them? And you might be surprised to learn that many flat earthers are anything but christian. Just another example of the genetic fallacy. Now, just because someone is a flat earth proponent does not disqualify them from being christian (as in your “people who claim” statement). A bit ignorant, perhaps, but certainly not exempt from salvation. The book of Job, which i am currently studying, is a book about, among other things, accusation. Satan accuses God, then accuses Job, who accuses God, Job’s friends accuse him, he accuses them, then accuses God again. And what answers does God give? NONE. It’s a book about beings that don’t trust, at least completely, others, and God. In Job we see redemptive suffering. We get the behind the scenes. We, the reader, are given information not available to the participants. Job’s friends had no room in their theology (retributive) for anything like redemptive suffering. Their theology had no room for grace. And no true respect for sovereignty. Next time you read it, don’t get caught up on ostriches, spheres, foundations, speciation, evolution, etc. It is not about any of those things. It’s about being used by God, even, from our perspective, harshly, but in the end to glorify God. Job didn’t “deserve” what happened to him, but that’s the point. Is Satan right? Do those of us who claim to love God do so simple for our benefit? Do we love Him because He blesses us? What if things turn bad. What if those blessings disappear? What will we do then. That’s where faith is found. Faithful no matter what. Job passed the test. Sure, he complained (and who wouldn’t, considering), but he did not curse God and die. And we see that he is rewarded. Not because God “owed” it to him, but for his faith. I wonder how you and I would fare? I hope i never have to find out. Just as a side note, John Walton points out that the OT “Satan” (i.e,, accuser) is more of a job description or role than a personal name. I don’t disagree with your poet-authorship perspective, but that particular part of the argument might not be the strongest one. Hi Mel, thanks for the link. I just listened to Walton on Job while exercising yesterday. I listed to this somewhat longer version. https://www.youtube.com/watch?v=z-6G2cE118A Simply a fantastic lecture. I will be incorporating elements of what he says in to my next post which I hope to work on next week. Joel, I know you have addressed this before, but I want to point out for any new readers that all the talk about genetic “frontloading” by YECs such as Ham, Jeanson, and others from AIG makes no sense in light of their belief in a global Flood, supposedly occurring only a few thousand years ago. Such an event would have largely destroyed any such frontloading, and left only pairs of animals in such a tight genetic bottleneck (with extremely low diversity), requiring severe inbreeding, in foreign and hostile environments entirely unlike their normal habitats. To imagine many of them even surviving, let alone engaging in hyperevolution –generating thousands of new species in only a few hundred years as Ham and friends claim, is absurd. They have nothing close to a viable mechanism for it, or fossil evidence that supports it; indeed, extensive evidence from genetics, the fossil record, and population biology refutes it. Take the cheetah. It evidently suffered genetic bottleneck (but far less severe than the Ark pairs) about 12,000 years ago, and it still suffering today, showing low diversity and many pathologies–the exact opposite of what Ham needs for his imaginative hyperevolution or “rapid post-Flood diversification” model. Hi Glen, A good reminder to add a link to my post on “The great genetic bottleneck” https://thenaturalhistorian.com/2016/03/30/the-great-genetic-bottleneck-that-contradicts-ken-hams-radical-accelerated-diversification-ie-post-flood-hyper-evolution/ I always have this problem, I would love to point out these very problems in every post but I’m usually running 2000-3000 words already so I can’t take the tangent each time. I can’t disagree that this point bears repeating every change I get. Nice piece. I was wondering what the position of the tinamous — the non-flightless sister group of the ratites — would be in these various models. They don’t have the weird fluffy feathers of the ratites, and they do have a keeled sternum (and they don’t look at all like ostriches), but they share some distinctive jaw features with ratites and phylogenies based on DNA group them within the ratites. While multiple females lay eggs in the same male’s nest, he takes care of all of them and so doesn’t show the carelessness of Job’s ostrich. Would they be regarded as of the same kind as the ostrich in a YEC model, or would they be regarded as different, with the DNA similarity being spurious or unreliable?